NOTE: If your computer is running on Windows Vista® or Windows® 7, click here for instructions. For Windows® XP users, click here. You can find the list of downloadable files for Linksys devices by clicking here. On the Start Screen, right-click the lower left portion to open the shortcut list and click Device Manager. Look for Network adapters and click on the Flag button to expand. Right-click on the Linksys adapter and click Uninstall. NOTE: In this example, the Linksys AE3000 is used. To reinstall your network adapter, use the driver downloaded from the Linksys Support Site. For more instructions, click here. 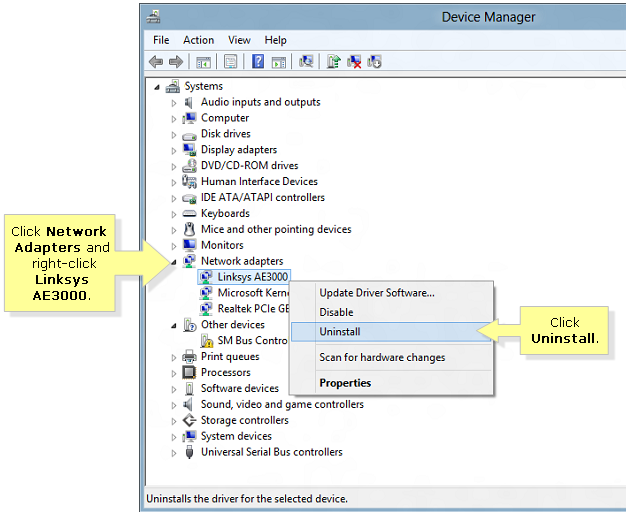 After reinstalling the driver, restart your computer and check if the driver is properly installed through the Device Manager.